About ten years ago I ordered a bunch of scents from a company called smell THIS!, which specialized, as Demeter still does, in unexpected real-world single-note scents: the company still exists, but their line is disappointingly attenuated. Back then, I ordered seven of their fragrances, and I can't believe I can still remember all of them: Popcorn (convincingly salty-buttery), Leather Jacket, Wet Laundry (remarkably wet-smelling), Mocha, Cake Batter (vanilla-laden yellow cake), Fresh Towels (after that wet laundry has been put through the dryer, I guess), and Campfire. The last was the only one I couldn't wear: it did smell like a smoky campfire, but one that someone had thrown a tire or some glossy magazines on--it was sickeningly resinous. But a fragrance can be built around a smoky note and still work; it just can't be all about the smoke. 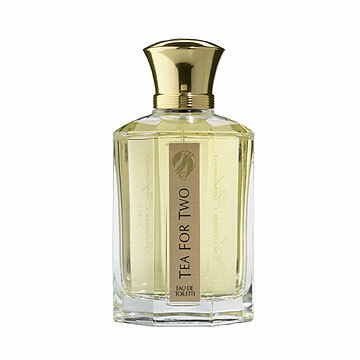 L'Artisan Parfumeur's Tea for Two is, as the name tells you right off, based on tea, in this case Lapsang Souchong and smoked teas; but where tea scents (at least the ones I've tried) tend to be light and fresh, Tea for Two is dark and mysterious, adrift in curlicues of autumnal smoke. Everything else in the top and middle of the scent--whispers of spices such as cinnamon and ginger, a flash of citrus in the top--is just an adornment for the smokiness and the bristly warmth of the tea. Hours later--this is a very long-lasting scent which stays close to the skin--the smoke dissipates and leaves behind a haze of warm, woody vanilla. I expect there are people for whom the smell of smoke means only one thing ("FIRE! "), but for anyone with fond memories of a fireside pot of tea, Tea for Two is comfort in a bottle.